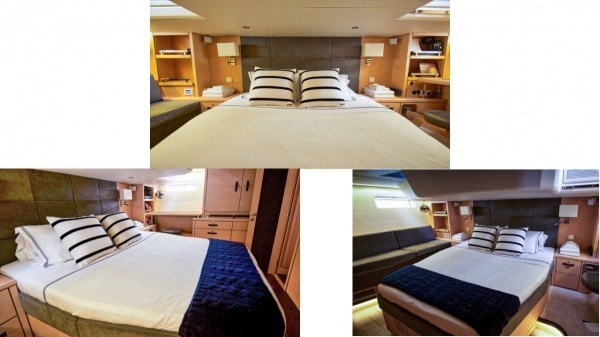 Full Beam Master King aft with bathroom + 2 identical Queens forward, each with bathroom + 1 Upper/Lower bunk bed cabin with day head with shower opposite. Crew are self-contained forward with access over the bow. 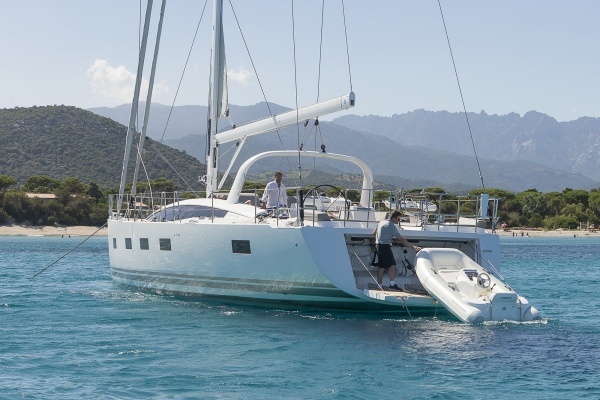 Available in Maine during August (2017) with dates open in July and September as well, the 2016-built Jeanneau 64′ sloop, SERENITY, is comfort and sailing performance itself. 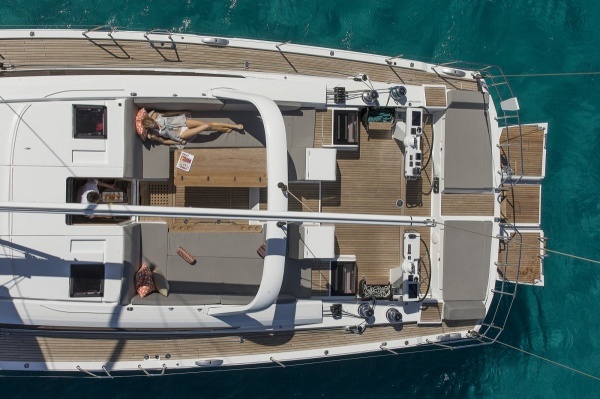 This beamy modern auxiliary sailing yacht carries her beam all the way aft and has a large genoa, as well as a staysail and mainsail, all brand new North Sails, which give the yacht that extra 10% sailing performance that Captain Gareth Erlenbusch loves. 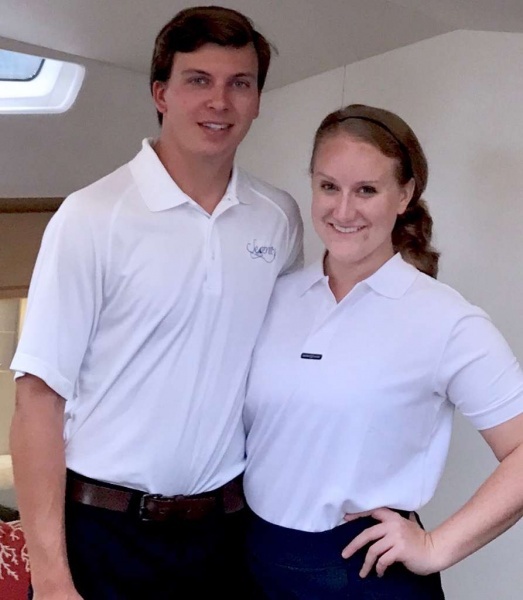 Gareth is from Ohio and grew up sailing performance multi-hulls and is surprised to see all this monohull offers. She has lots of deck space aft of her cockpit which flows right into the cockpit. 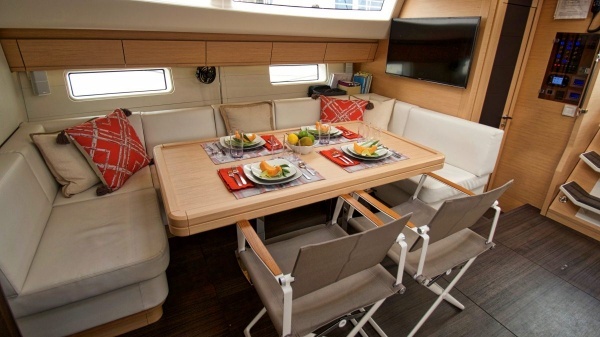 There are dual steering stations, bimini awning, comfortable on deck dining tables that seat six, sun bed to port with push button controls that converts it to a sofa. There is refrigeration there as well, teak decks, two reverse winches; she is like a large super yacht. 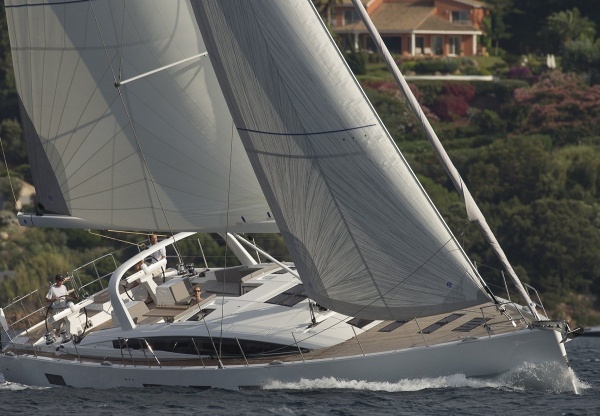 SERENITY is the largest that Jeanneau puts out. The water toys are stored in the garage under the cockpit, and a swim platform folds down out of the stern, large enough to hang out on. The yacht has a 16′ Jet Tender with 100 hp outboard that goes 55 knots! There’s also a second tender that holds eight people and luggage, which they tow or stow on the bow where the sun beds are. The modern saloon with gray floors is light and airy and spacious and colorful. 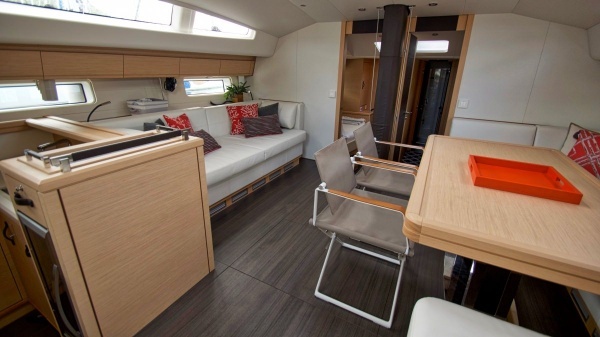 It has television, air conditioning, which is always running, and six guests get a choice of four cabins in three compartments, assuring privacy for all. 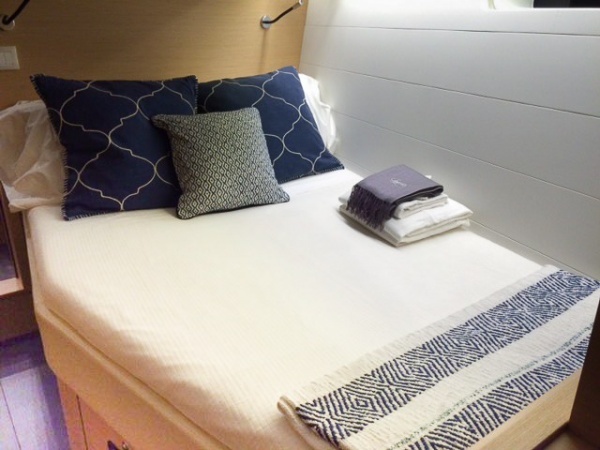 There are two Queen cabins forward each with private bathroom with glass showers. There’s a kids cabin amidships with upper and lower single bunks with day head opposite. 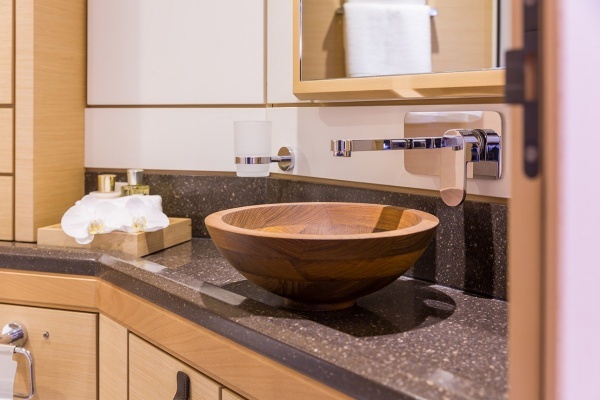 And the master cabin is the full width of the ship with centerline King berth, couch to port, desk to starboard, and it has its own bathroom with wooden bowl sinks. The crew of two sleep forward over the bow. 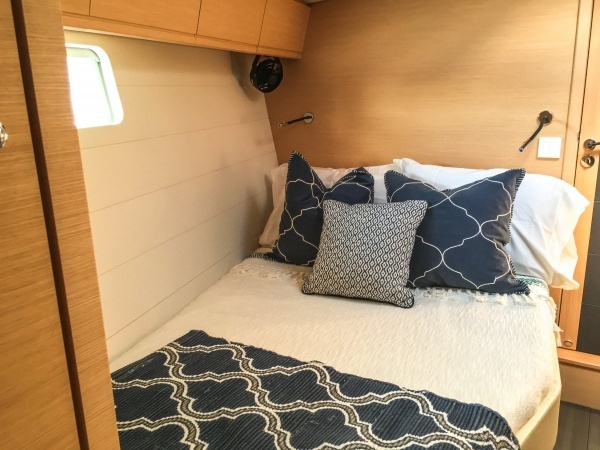 SERENITY is a brand new 2016-built boat, available for charter in New England this summer and the Eastern Caribbean from Grenada to St. Maarten to the BVI this winter (2018) for $19,500 a week plus expenses. During the winter her rates are all inclusive: $24,500 a week for six guests; $24,125 per week for five guests; $23,750 weekly for four; $23,125 for three; $22,500 a weekk for two. Christmas & New Year’s: $26,950 per week inclusive up to six guests; Please inquire for seven and eight guests, families only.